Have you noticed more hair in your brush or shower drain lately? Unexplained, excessive hair loss can be worrying, but the good news is there’s often a way to fix it. 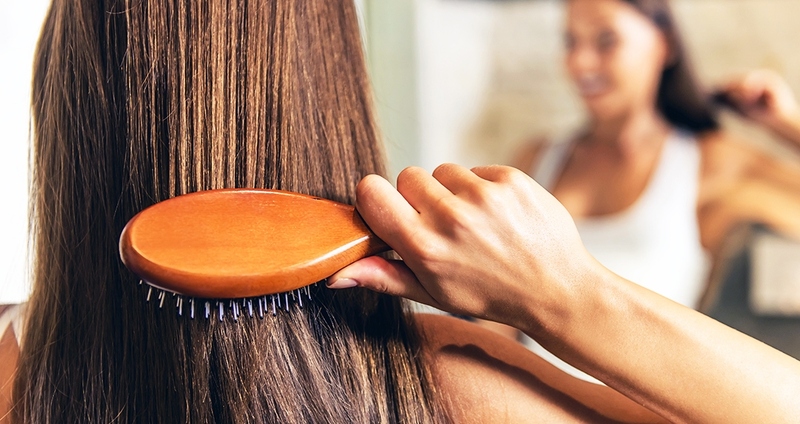 Understanding the root cause—whether it’s genetics, stress, hormone disruption or vitamin deficiency—can help you choose simple lifestyle habits that will keep your hair out of the brush and on your head. Kupersmith uses holistic approaches to treat patients who are losing too much hair, often recommending nutrition and lifestyle changes, and a simple blood test to check for possible imbalances in ferritin, cortisol and thyroid levels. Underlying hormone imbalance is a common factor causing hair loss in women, and this can be triggered by birth-control pills, pregnancy, childbirth or ovarian cysts, as well as certain medications. Hair has normal cycles of growth and shedding, which can be sped up due to stress or trauma. If you suddenly notice excessive hair loss or clumps of hair falling out, it could be a stress-induced condition called telogen effluvium. Think back to a few months ago to recall any particular stressors. It’s normal for the shedding cycle to jump-start during high-stress or traumatic events (including childbirth, surgery and illness), which usually shows up as excess hair loss anywhere from six weeks to three months afterwards. Managing ongoing stress with practices like breath work, yoga and meditation can help. If your stress is not ongoing, the growth cycle can be enhanced and your hair will return to its normal fullness with the following healthy hair habits. Eating a whole-foods, nutrient-dense diet is crucial to supporting healthy hair growth, says Kupersmith. Luscious hair thrives on protein, iron, zinc and B vitamins. Stock up on foods rich in these nutrients, including lean meats, dark leafy greens, nuts, beans and fish. Zinc and iron deficiency are both linked to hair loss. Pumpkin seeds, spirulina and dark chocolate are high in both zinc and iron. Omega-3 essential fatty acids have been scientifically shown to support hair growth and thickening. Eat foods like wild-caught salmon, egg yolks and hemp seed. If you don’t get enough omega-3 foods in your diet, take one to two capsules or one tablespoon of a top-notch fish oil supplement to help reduce inflammation that causes certain hair-loss disorders. Iron can be found in grass-fed beef, liver, spinach and black beans, but supplementation may be necessary if you know you are iron deficient. Kupersmith recommends food-based iron supplements because they are less irritating to the gut and won’t cause constipation. Biotin rebuilds and thickens hair shafts that have been damaged from too much sun, blow drying and ironing. Vitamin B5 supports the adrenal glands, which stimulate hair growth. Both can be found in eggs, beef, chicken, avocado, legumes and nuts or by taking a B-complex vitamin daily. Collagen and gelatin are “essential building blocks” for healthy hair, says Kupersmith. Drink bone broth or consider taking a powdered collagen supplement. Increasing blood circulation to your scalp can do wonders for the health of your hair. Take time in the shower to massage your scalp in a circular motion. A deep scalp treatment using coconut oil with several added drops of rosemary essential oil—both shown to improve new hair growth—can be massaged into your scalp before bedtime. Shampoo, massage oil into scalp and then wrap wet hair in a towel and leave on overnight. Many specially formulated shampoos are made with proven ingredients to prevent hair loss, too. But Kupersmith recommends avoiding shampoos or other beauty products formulated with known endocrine disruptors such as phthalates, parabens and sulfates.